-Tucker Hibbert card to hang on your fridge, shop wall, etc. That’s a total of 17 chances to win! All you have to do is SIGN UP HERE once, and you are entered to win for the entire season – it’s that easy! Your odds are good, as it's recently been revealed that Tucker does in fact win frequently. Last season 128 people won free oil in a similar promotion! 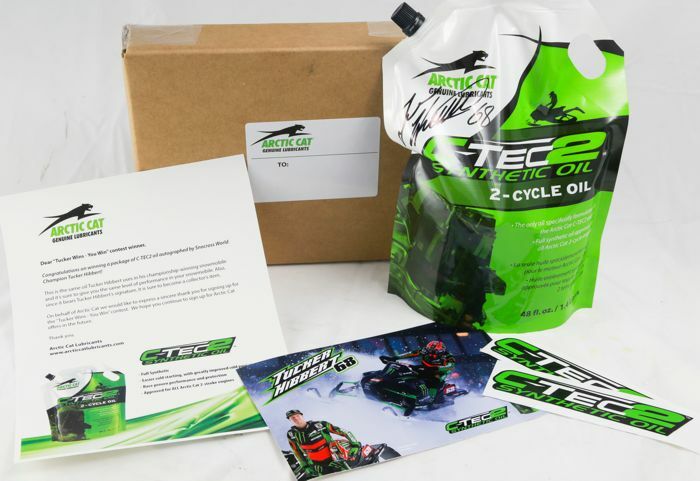 Follow Hibbert’s first season using C-TEC2 oil HERE at his OFFICIAL WEBSITE. Good luck! 17 Pro Open Finals for ISOC, Lake Geneva is a 3 round event for the Pro classes. Add the X games and it makes it 18. Normally I'd agree with you Kimster, except that Tucker asked me to fill in for him at the X Games this year. Apparently he has confidence in me bringing home the gold on his sled, despite not having raced snocross since Duluth 1993. I haven't yet nailed down the oil promo for this developing situation. If Tucker changes his mind and races X Games instead of me, then you will be correct and we'll call it a bonus swag bag giveaway. If your racing I will be there in person to witness it!